We are excited to share our newest team member's very first blog post and what a way to start than with a gorgeous layout using 'Hello'. Please make welcome... Nicole Nowosad. 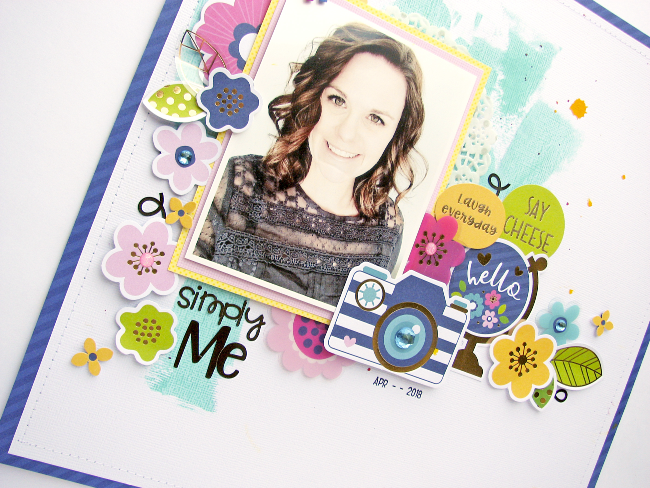 Hello, it's Nicole with you today sharing a layout about 'me'. 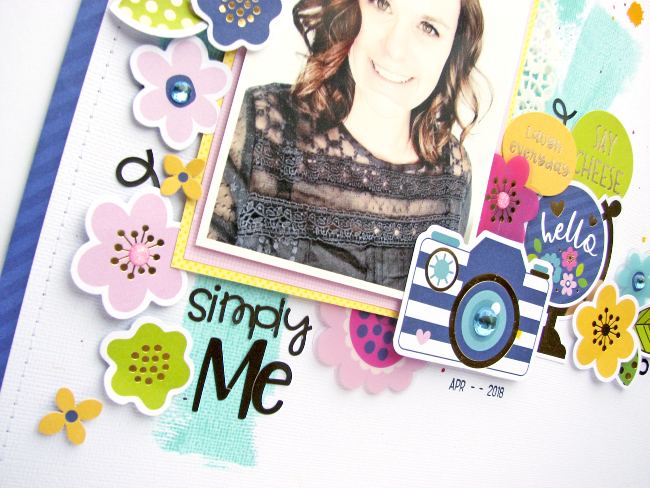 As soon as I saw the Hello collection, I knew it was a collection I was meant to scrapbook with! The colors and bold patterns in the collection just called to me, so I decided to scrap a photo of myself. I started by washing the background of some cardstock with an aqua paint that co-ordinates with the collection and then was drawn to all the lovely florals in the Hello Odds & Ends pack. After I added my photo, I layered the clear and die cut florals around it. I opted to add in other diecuts from the Hello Odds & Ends pack as well as the Hello Chit Chat pack to fill in around the florals. I used one of the swirly borders from the Beetle Black Fancy Frills CS stickers and trimmed it down to add into my floral clusters. To finish off the page, I added in a simple title using Beetle Black teensy type CS stickers and Beetle Black Abigail CS stickers. Beautiful layout! Love all the layers!